As part of diversified portfolio component, real estate plays an important role in investment world. Investing in global real estate mutual funds is one of the smart ideas for investor to achieve better goals. The best global REIT mutual funds include: Invesco Global Real Estate Income A, Prudential Global Real Estate A, Cohen & Steers Emerging Markets Real Estate, etc. Investing in real estate sector can be done through several vehicles. Investor can buy real estate asset by purchasing a house or rental house. The other alternative is by purchasing investment funds such as mutual funds, exchange traded funds (ETFs), and closed end funds (CEFs). Using these investment funds, investor can easily diversify his/her portfolio. 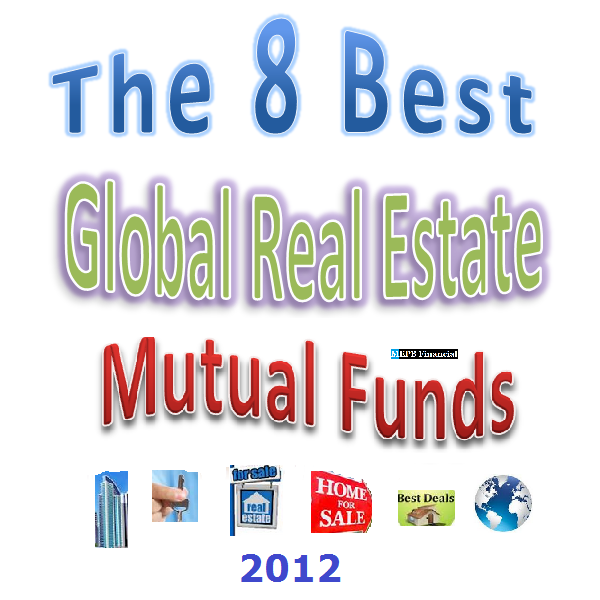 This article will focus on real estate mutual funds especially global real estate mutual funds. There are two types of real estate mutual funds or REIT funds such as US real estate mutual funds and global real estate mutual funds. Global real estate mutual funds invest mainly in non-U.S. real estate securities, however it may also invest in U.S. real estate stocks / bonds. This global REIT funds may purchase debt and equity securities, convertible securities, and other real estate investment trusts (REITs) entities. Mutual funds in this article are being selected based on its long term performance. You will also find fund review including fund expense ratio fee, management, sales load, turnover rate, performance, table comparison, ticker, initial investment information, etc. 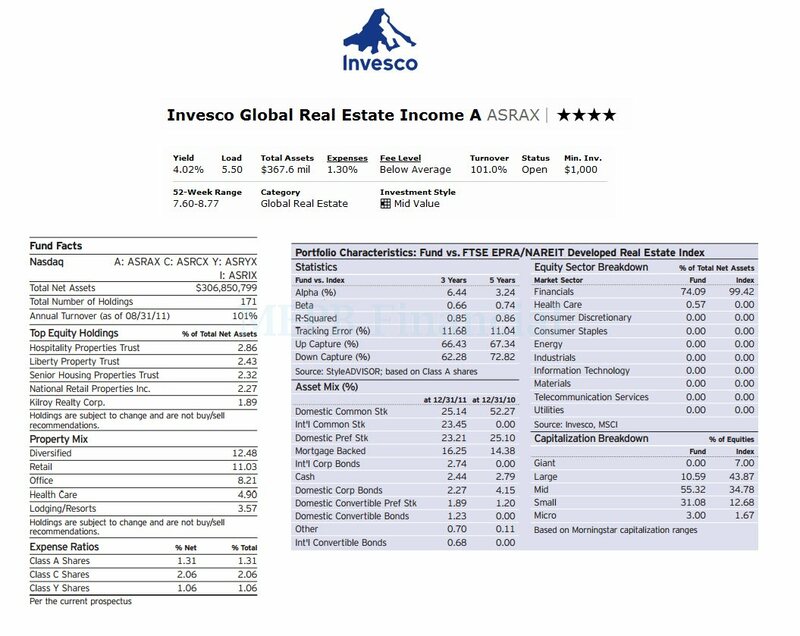 This Invesco Global Real Estate Income fund seeks current income and, secondarily, capital appreciation. This Global Real Estate fund generally utilizes its net assets to purchase the securities of real estate industry issuers. This fund may invest in both stock and bond. The fund invests in issuers in at least 3 different countries, including the U.S. It may invest in developing countries. This fund has been rated with 5-stars rating by Morningstar. Joe Rodriguez, Jr. has managed this best fund since its inception in May 2002. The fund has 12-month dividend yield of 4.09%. The most recent dividend was distributed in December 2011 ($0.11). The annual expense ratio of this REIT fund is 1.30%. The 3-year annualized return is 23.26%. The top equity holdings as of December 2011 are Hospitality Properties Trust (2.86%), Liberty Property Trust (2.43%), Senior Housing Properties Trust (2.32%), National Retail Properties Inc (2.27%) and Kilroy Realty Corp (1.89%). The investment objective of Prudential Global Real Estate fund is providing capital appreciation and income. This mutual fund invests majority of assets (>80%) in real estate companies equities especially REITs. It invests >40% of total assets in foreign securities. It is classified as a non-diversified mutual fund. The total net assets of this top performer mutual fund are 881.37 million. 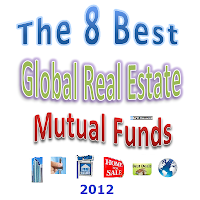 This global real estate mutual fund has annual expense ratio of 1.30%. The minimum initial investment for brokerage account is $2.500 and $1.000 for retirement account. There is 0.30% 12b1 fee. The fund manager is Marc Halle. This global real estate mutual fund can be purchased from 103 brokerages. The other classes of this sector fund are Class B (PURBX), Class C (PURCX), Class R (PURRX) and Class Z (PURZX). 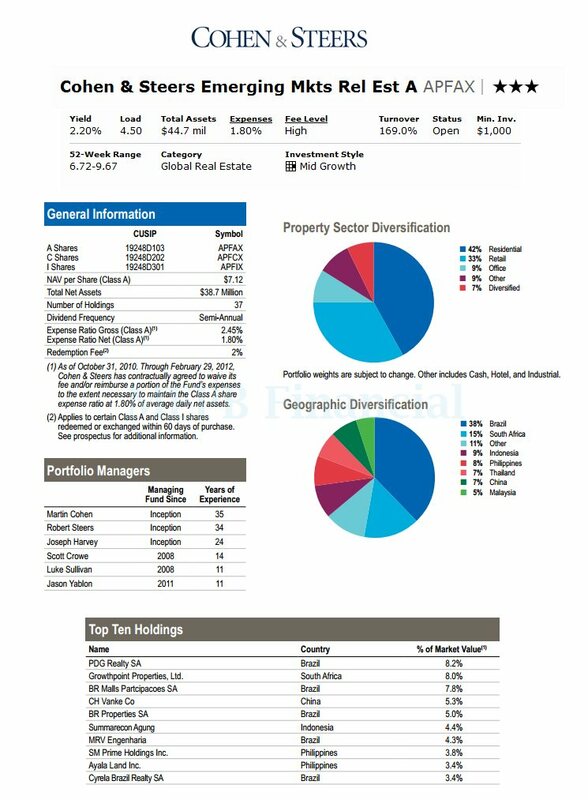 The top largest stock holdings as of January 2012 are Simon Properties (5.3%), Ventas (3.0%), Sun Hung Kai Properties (2.7%), Westfield Group (2.7%) and Public Storage (2.6%). These are the top holdings out of a total of 138 holdings. 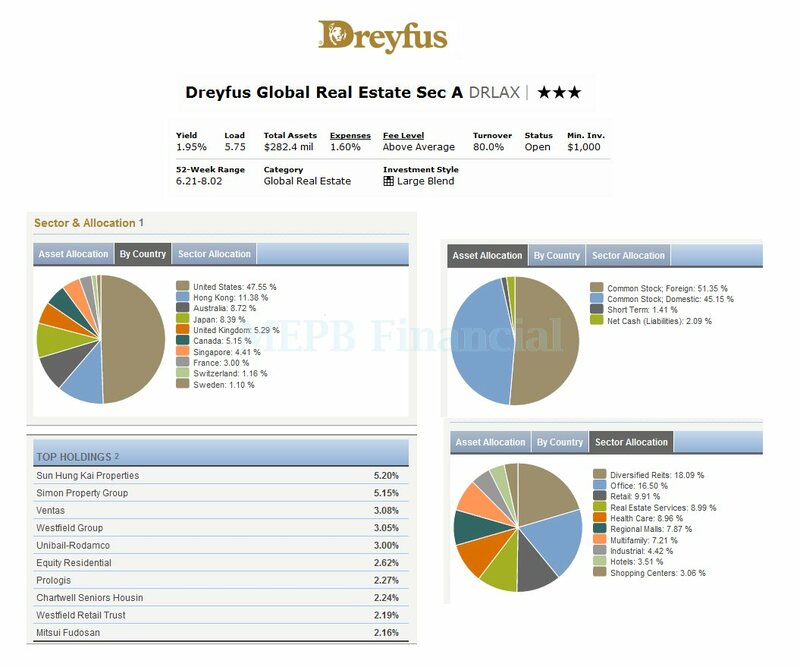 The Dreyfus Global Real Estate Securities fund uses its net assets to buy publicly-traded real estate sector companies stocks. It typically invests in a global portfolio of equity securities of real estate companies, including real estate investment trusts (REITs) and real estate operating companies. This mutual fund will invest in companies which are located in the developed markets of Europe, Australia, Asia and North America (including the USA). Morningstar gave this top global real estate mutual fund a 4-star rating. The annual holdings turnover as of February 3, 2012 is 86%. The fund is currently managed by Peter Zabierek. This best fund was first introduced to public in December 2006. The YTD return is 7.60%. Based on the load adjusted return, this REIT fund has returned 20.52% over the past 3-year. The 5-year annualized return is -4.08%. The top holdings of this fund are Sun Hung Kai Properties (5.20%), Simon Property Group (5.15%), Ventas (3.08%), Westfield Group (3.05%) and Unibail-Rodamco (3.00%). The top country allocation is United States (47.55%), Hong Kong (11.38%), Australia (8.72%) and Japan (8.39%). The ING Global Real Estate fund objective is to achieve high total return consisting of capital appreciation and current income. This mutual fund normally invests majority of net assets in a portfolio of real estate industry companies’ equities. It may invest in companies located in countries with emerging securities markets. The fund may also invest in convertible securities, initial public offerings (IPOs) and Rule 144A securities. T. Ritson Ferguson has been the lead manager. This best performing fund was introduced to public in November 2001. The fund has 3-stars rating from Morningstar. The total net assets are $3.67 billion. The fund has 2.30% dividend yield. It can be purchased from 105 brokerages. The maximum sales charge of this fund is 5.75%. It has 5-year annualized return of 21.66%. The top sectors as of December 2011 are Diversified Property Holdings (24.80%), Retail: Enclosed Malls (18.20%) and Office Buildings (15.10%). As of January 2012, the top holdings are Simon Property Group Inc (5.38%), Sun Hung Kai Properties Ltd (3.23%), Boston Properties Inc (2.99%), Avalon Bay Communities Inc (2.91%) and Mitsubishi Estate Co Led (2.73%). The Cohen & Steers Emerging Markets Real Estate fund utilizes its net assets to buy securities issued by emerging markets real estate companies. 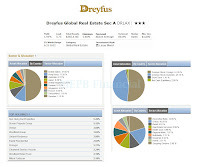 It invests substantial percentage of its portfolio in Asia Pacific REITs and REIT-like entities. This mutual fund has dividend yield of 2.40%. The annual expense ratio (1.80%) is higher than the average in the Global Real Estate category (1.46%). This global real estate fund has minimum initial investment of $1.000. For retirement account, please check with your account administrator. The fund is now managed by Martin Cohen. The best 1-year total return is in 2009 with 40.59%. The 3-year beta is 1.17. As of December 2011, the top property sector diversification is Residential (42%), Retail (33%) and Office (9%). The top geographic diversification is Brazil (38%), South Africa (15%) and Other (11%). The Russell Global Real Estate Securities investment fund seeks current income and long-term capital growth by investing in equity securities of real estate companies around the world. This mutual fund mainly invests in common stocks and other equity securities issued by U.S. and non-U.S. real estate companies. The fund has total net assets of $1.59 billion. This best ranked fund is managed by Bruce A. Eidelson. He started managing this fund in 2002. The YTD return of this fund is 7.73%. The annual expense ratio is 1.36%. This global real estate mutual fund is rated with 2-stars rating by Morningstar. The top holdings as of January 2012 are Simon Property Group Inc (5.5%), Sun Hung Kai Properties Ltd (3.9%), Westfield Group (2.7%), Equity Residential (2.6%) and Ventas Inc (2.6%). This Third Avenue Real Estate Value fund is rated with silver rating by Morningstar analyst. There is no sales load. This fund has total net assets of $1.7 Billion. This global real estate mutual fund has an expense ratio fee of 1.4%. The investment style of this fund is mid blend. 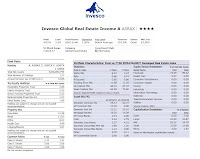 As part of top rated mutual fund, Invesco Global Real Estate A fund has a sales load of 5.5%. The current yield is 1.60%. The top 3 stocks are: Simon Property Group Inc, Sun Hung Kai Properties Ltd, and Ventas Inc. The annual holding turnover rate is 80%.